The outlook for the full fiscal year is unchanged from that announced at the beginning of the fiscal year. In the first quarter the Office Business saw lower profit, while the Industrial Business recorded higher profit, so although there are areas of strength and weakness depending on the business, operating profit is above the level originally forecast by the Company. 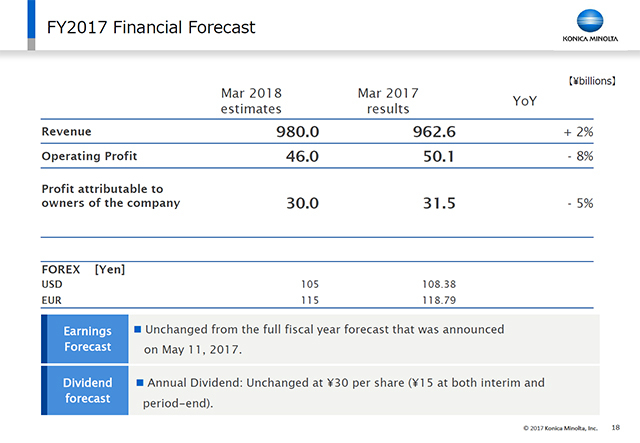 In the second quarter also we will secure profit, firmly achieve the published external forecasts, and aim to exceed them. There has been no change to the dividend forecast.